Khalid’s Free Spirit is smart, soulful and smooth as silk. The Grammy nominee infuses alt-R&B sensibilities into instantly addictive radio-friendly jams — it’s a winning combination. 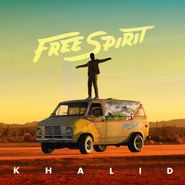 Khalid’s honeyed voice floats over the glossy, sometimes trippy production, the lyrics candid, vulnerable and brave. There’s a reason Khalid has gotten so much buzz and this excellent album proves he deserves to be at the top. Essential listening for fans of sultry, sophisticated R&B.